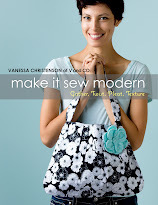 V and Co.: V and Co: giveaway: stop.go.quilt.sew! today i get to be on the blog tour for miss angela yosten's new book: Stop. Go. Quilt. Sew! and i just have to gush a little about this lady. she is the most delightful person, so genuine, nice and kind, and of course super talented. as most of you know that 3 of my 4 noisemakers, aka my minions, aka my children, are indeed boys. i know i know, they are easier in the respect of not as many meltdowns, drama and so forth. BUT when it comes to making things for them...not as easy my friends. so whenever i see something that is cute and handmade especially for boys...i'm there. now, make a whole book about it... doubly there. soooo lets talk about this book. shall we? this book has awesome designs and ideas, and has a great all around feel and look. here are a few of my faves! 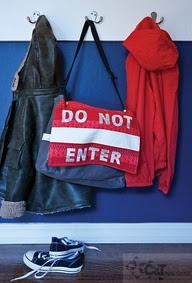 this adorable do not enter bag. i know sometimes i'm scared of what might crawl out or bite my hand as i open my boy's back pack...why not give a fair warning? 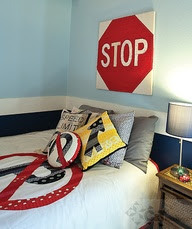 now i have a soft spot for pillows and decor, so uh of course i'm going to love the stop sign and the the speed limit pillow and well might as well add all the other sign pillows on there! too cute, you could also frame them if you don't want them as pillows. there are quilts, and shirt add ons, and decor, and so much more. i really love this book. good job angela! i've mentioned that i had 4 kids. and that three of them were boys. well the last one is a girl noisemaker. and for the longest time she would make up words or have her own little language if you would, like for example pizza was "choppy", and spaghetti was "spay" those sort of things. well for the longest time every time we were in the car she would yell in her own language something over and over again and we didn't know what in the heck she was saying. we just smiled and said "yes, that's right! sky!" or "yes, you're right! that's a car!" YEARS PASSED PEOPLE and we just never knew what in the world the girl was saying. well, finally the mystery was solved this last year. see we moved from a remote area momentarily to a very populated area...then to iowa. and then the girl now a little older and more "wordy" was able to vocalize more. while in the car she would randomly yell out "santa was here!!" and we would just scratch our heads and chop it up to "well she is OUR child, and have you seen the siblings? would we expect anything other than randomly yelling out things about santa in the middle of summer?" one day we were going down a new way and she kept yelling out "santa was here!!" and then there would be a lull and then again "SANTA WAS HERE!!!" it took about 4 times till a light bulb came on over my husband's head. "oh.my.gosh. i think i know what she's talking about." i look at him like this is going to be good. and he says "wait for it....wait for it...okay in like 3 seconds..."
years people. she's been telling us for years, where santa touches down and lands his reindeer in order to deliver happiness to boys and girls. yup. i wouldn't expect any less from one of my awesome family members. 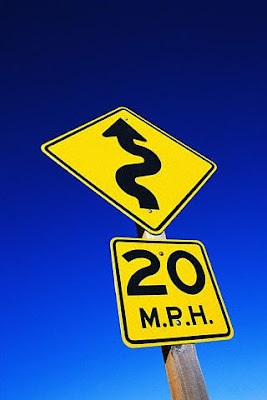 "snakes ahead beware 20 Many People Hurt." we are some kind of special at our house. i have a book to giveaway. for a chance to win tell me: if you had a sign, what would your sign say? what's your favorite kind of project, a fast one or one that takes a little more time. which is more rewarding? you have till this friday the 17th to enter. I like projects with more intricate piecing, so they take more time. Very rewarding when I finish, but sometimes it takes way too long because I lose interest. type of project depends on time of year, near Christmas fast ones, other times more involved ones. Love your daughter's interpretation of the sign, for all we know she is correct. Thanks for the giveaway. I love trying new things; smaller, faster projects excite me as I can finish them quickly and get a great reward when I see the joy on the recipient's face. Thank you for such an awesome giveaway; I have a son too and finding I sew way more girl things than boy things - and I have only the one child! 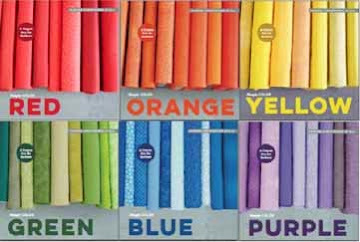 My sign would say Fabric Sale! I like a mix of projects, I love the thrill of accurately piecing and completing a complex quilt. But sometimes a quick fix like a bag which showcases a beautiful piece of fabric is good for instant gratification. "Only positive comments received here" would be my office sign and for home "quilts alot". Love fast projects, the other type are neer finished. I do mostly quick projects. At the rate I buy fabric I've got to use it fast! 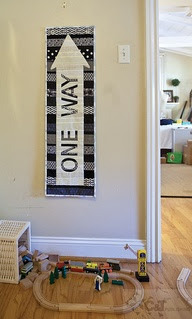 My sign would say Caution: quilter ahead. I get more satisfaction out of completing a long term project, cause it's usually harder, but sometimes a girl's just gotta have an instant gratification project. "Caution! Wife is grouchy today"
I love short term projects and the feeling of "finishing" something. I would be a YIELD sign. I like a quick project after I have an intense thinking quilt! I try to have both projects going on at the same time. I like to have a long complicated project in the works and finish little things whenever the long project becomes overwhelming. I find a long project to be more rewarding. My sign would say..."Be Kind". Wish that we all would, thanks for the giveaway, Angela's book is awesome. I like both kinds of projects, it's fun to whip through something and have a finished project in hand. But I enjoy challenging myself and taking time too, it builds skills and people are go struck with fancy piecing or details! I am ok with a project that takes a little longer ... I kind of like to see it slowly evolving before my eyes! Watch my vision come to be, ya know? Hmmm...a sign? Maybe "Slow children Playing." That one always makes me laugh. I like easy, tube skirts. They take no time at all and are super cute! Thanks for the chance. Mine would say keep out. My sign would be "Runs with Scissors"
I like longer projects. I have waay too many wall hangings. I need to make quilts for my kids to inherit. This is such a fun idea! My sign should say...Caution, Cute But Oh So Clumsy! I think the longer projects can be so beautiful and so rewarding, but it's summer I have gone for quick and easy. My fav is What happens at Gandma's house stays at Gandma's house.. Of coarse I spoil my gandkids, and its Gandma without the r because thats my name. I have 5 new gandkids, so I am really excited and full of love, I cant rock, kiss or hug enough and lucky for me we live close by all 4 of our grown Sons. The rate were going, I will have 5 more.. I like projects that are quicker. I tend to finish them and go to the next one rather than longs ones that take a lot of time! My sign would say " caution - pins on floor". My favorite kind of project is the one I just finished. Mine would say Danger: Chocolate Eating Area! I like to have both types on the go at the same time! "Drama Ahead" would be my sign! I used to and still do love a fast project but recently i made a quilt block that was small and time consuming and to make a quilt with it, I'll need like 150 of them... and i'm okay with that. No, it won't get done anytime soon but it's intricate and rewarding on it's own level. my sign would say "procede with caution." or "sudden turns ahead" but who dosn't change their mind often? I really love quick projects because my sewing time is so sporadic that a lengthy project can take me months. I like fast and slow projects. I love the ones where I'm not so sure how it is going to turn out and then as I progress it gets more and more fantastic. 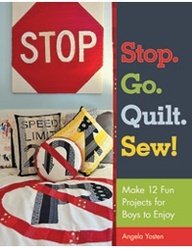 Slow down and sew! Thanks for the giveaway. I love quick and easy and long and slow. I choose complex sewing projects to increase my skills then simple projects for instant gratification. This rotation prevents me from getting fustrated or bored. Thanks for the giveaway. That is adorable! Your daughters favorite sign is also my favorite sign. When I was little, sewig deer signs was a game. While taking road trips, the first person to call it out got an ice cream. 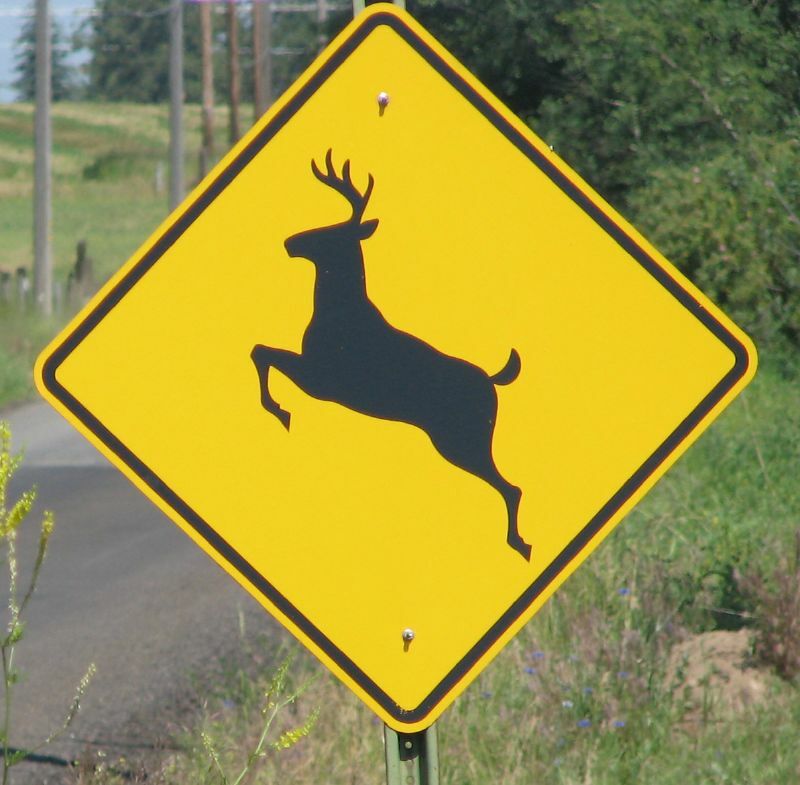 Then after that we'd keep keep score of how many deer signs we all saw. We would earn $.25 for ea. one we called first. At the end we would tally up our scores to see how much we'd all earned in spending money. It was only ever like $5 for ea of us three kids but it kept us busy on the long trips. I like little projects because they are quicker. I like to do both quick and lengthy projects. I forgot my email addy in my first comment. Minha :Cuidado mulher estressada hoje. I like short projects because I can get them done. The longer ones seem to linger around f-o-r-e-v-e-r. I like both. I like long quilts but sometimes I want to do one quicky. I would like a sign that says blessed! My fav sign would say something like - quilt shop next right. What could be better? I love small projects for instant gratification! My sign would say "watch out for hidden fabric stashes"! Right now I"m all about the short projects since I have a 6 mth old and I don't get a lot of time to sew. But normally I like a longer project and I'll probably get back to that soon! My sign would say... Stop! Free Quilts Ahead! I like quick projects when in a hurry but LOVE those longer ones, they are much more rewarding. I think my sign would say "Caution:pins and needles on floor, Enter at your own risk"
My little 20 month grandniece now plays a game she made up called "Look!" She says "Look" and points in a direction. I turn and look, there isn't anything there, and she starts laughing. She did that with the truck mirror, I look, she is looking into the mirror, and then starts laughing. So, I would have an Octagon shaped red stop sign that says LOOK. my sign would say: Always challenge yourself! I like faster projects but always love trying new things. I'm just starting to quilt. I've always sewed and love making purses! I am sorry - had to delete my post as I forgot my email so will enter that first!! a(dot)haun(at)sbcglobal(dot)net I love a longer project as I find it so rewarding and I love the feeling of accomplishment is give me!! Oh, my favorite sign is 'work hard, and be nice', it says it best. My favorite projects are the quilts I make for hospice with my quilting friends for a local hospital. After our meetings twice a month we share lunch! So, quilting and eating! My sign would be serial sexist, she sews everything that sits still so keep moving. I love to sew clothes for little girls. Mostly little dresses. I always have some project going on...housework isn't a priority! I prefer a project that's a little more challenging; though at the moment that's most of them as I've not been quilting long. I also always want a railroad track sign. I don't know why. My favorite projects are quilts! They last a lifetime, whereas sewing an outfit or something only last as long as someone fits in it. My sign would say "do not wake". I like quick projects. I need the instant gratification of a job done. I want a sign for rabbit crossing. I love your daughter's story. I like small and medium projects. I like large projects with large pieces. I love the process, but it shouldn't take too long! Thanks for the giveaway! I'm all about the beware of animals sign since we often liken our sweet-o boys to bears & monkeys! I am all about the projects that take ome time! They are definitely the mot rewarding. But it really helps to have some quick tasks along the way to feel like you're still accomplishing things! What a cute story. I would rather do a fast project so I will get it finished! My sign should say "Proceed with Caution"
"authorized personal only" would be my choice. My favorite projects are quick ones, since I have no sewing room. I am,however, making hexes by the dozen. I think and think and think about a project and then once I decide on everything I want it done quick. Sometimes it happens but most of the time it takes longer than I would like. My sign would say "Ain't Nobody Home". Story: My grandpa suffered a stroke very late in life and it affected his speech. He worked really hard to regain some of his speech by diligently typing out Bible verses. After a time he was able to say a few words but most nouns escaped him. Every day at the same time, my dad would phone grandpa to make sure he was OK. Grandpa watched the clock so that he wouldn't miss Dad's call. If the phone rang at ANY OTHER TIME though, grandpa would answer it and say "Ain't nobody home" and hang up. I think that would make a very good sign. My sign would say "Caution Entering The Boon Docks"
Hopefully that would keep me from over-committing! Ha. Best project? Um a short one of course. I think bags. I love to make bags, which is why I was eyeing up that great boys satchel. OK, first of all "snakes ahead beware 20 Many People Hurt." Snot. Flying out my nose. LIke a reverse snort. Yeah, that's my ugly laugh. It makes very few appearances, thankfully. But... wow. awesomeness right there. Haha I like your husbands version of curvy roads! Lol! IG I had a sign? Oh lord! I'm not sure, I'll tell u what my husband would pick though! It'd say "beware! Crazy woman that makes stuff ahead"! He doesn't understand the enjoyment i get out of crafting! Thanks for the chance to win!!!! I love any quick machine sewn project. Thanks. I want my sign to say: Life has taken me to places that I never imagined I'd be. I've twisted and turned with the road and I've done my best. Sometimes I like a quick project. I need to feel immediate success. Sometimes I need a slow, lengthy project to think about problems and work things out. Ten years ago my house was destroyed by fire. I had a wall quilt that was in my car that I was hand quilting. Each night I quilted. I know that my sorrows over my loss and my hopes for the future were a part of that quilt. That quilt hangs in my sewing room and is my favorite. Thank you for the giveaway and the precious reindeer story. I like quick projects I think because they encourage me to keep going and do another. Our family sign would simply have to read Durrant Ice Cream Shoppe. I swear my noisemakers get to eat that stuff daily! Oh yea, me too!! I love a quick, easy in, easy out, knock your socks off project. With 4 boys, this book would be a tremendous help in the idea department! "Speeding Zone Ahead - She who dies with the most fabric isn't sewing fast enough"
My sign would say "Have Fun" ! I love to do projects that are quick to finish! thanks! My sign would say: The Best Things in Life Aren't Things! I am a slow quilter, finisher, even on quick projects. i like quick projects. i have a short attention span! if i work on long project, it's possible that it may get lost somewhere in the room! Quick projects are good to put in between the breaks I take from the long, intricate, time consuming ones, so I actually like both! Thanks again for the give away! Now, I'm sorry, but all I can think of is that "Here's Your Sign" song. But mine would probably say "Caution: unfinished project black hole. Enter at your own risk." Quick projects. Right now I need very quick. With summer nearing it's end, the garden going gang busters, and travel galore, anything quick wins. I am thinking I need to have both kinds in the works. I am thinking about starting Dear Jane now Paper Piecing it. And I also want to have a small quicker project so that I have a DONE project to show for my efforts in the quilting world. I tend to like the longer, more intricate projects, but that doesn't mean that I'm not sometimes tempted by the quick ones! To remind me that they are only little for such a little while and maybe it doesn't matter if the toys are all over the floor - I will miss them when they aren't (well maybe not the toys but the children definitely). I am not a no reply blogger but would prefer not to publicly display my email. Thank you. I should have a sign in my kitchen that says "glasses required" as in my reading glasses. We've had a few too many disasters when I cook without them. Let's just say tbsp and cups were once swapped and somehow my house smelled like beef for days. I like quick little quilts for my sanity, but when I make quilts for my family I like it to be more involved and more work because it's worth it because it's for them. My sign: "STOP...and smell the roses along the way." I like projects that are somewhat involved but not ones that take months and months--I tend to lose interest somewhere along the way if completion is not possible in a few weeks! Involved but not too time-consuming. A few weeks of work to achieve completion is just right! So sorry-- did not mean to post an extra time! I dont do too well with the samller ones, seems to work better for me to have a larger piece on the go. Working on the smaller ones though. My sign would say....everything always works out...too long? Probably! I like any kind of project, just completing one in general. With that said, I like having shorter ones because they are quicker return on investment in my opinion. I was just telling my husband yesterday that there should be a road sign like on maps at the mall that says, "You are HERE". That's what I want my sign to say!! I think that both kinds of projects have their own reward. When I'm doing a big project, I like to mix in fast and easy ones to give me the boost I need to keep going on the long one. I like the more involved projects. I'm especially partial to mysteries where clues are given once a week and the challenge is to finish the clue before the next is released. Of course not knowning the end result makes it that much more exciting. Hi, my name is Sarina and I'm a fabric-aholic. My favorite project is a completed one! I love all different types of projects and usually have several short, quick projects mixed in with a longer project. "Go away, let me sew!" in capitals maybe. Some days that's all I want to say.